People out there do not wish to spend much nowadays, as technology is changing fast and everybody wishes to stay updated with new devices. If you too are looking for a smartphone that is dual SIM, with great display, strong battery, and great additional features, then, the Samsung Rex 80 is the smartphone for you. 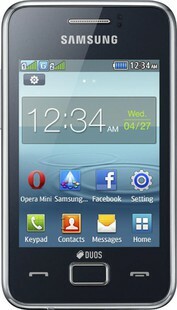 Let’s get into the Samsung REX 80 specifications. The device comes with a 3-inch TFT LCD screen with a resolution of 240x320 at a pixel density of 133 PPI. Powered by a 1000 mAh Li-ion battery, the phone is capable of long working hours. With inbuilt storage of 20MB, it is further expandable up to 16GB via a microSD card. This should be adequate to cater to your basic needs of storing text messages and contacts. The Rex 80 comes in a variety of funky colours hence leaves a powerful style statement. The Samsung rex 80 priced at INR 3,957 and with a 3.2MP rear camera, this device has proved to be trending among youngsters. For connectivity the phone offers Bluetooth, GPS, FM, 3.5mm jack, Mp3 player, HotSpot, and a USB port. All in all with much love from youngsters this device is proving to be a great entry level device. Samsung Rex 80 S5222r full specs and reviews as of Apr 2019. Buy it here!